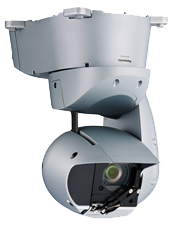 The new AW-HR140 is an integrated remote camera system that incorporates an outdoor housing, camera, lens and pantilt head. It is equipped with the same Digital Signal Processor (DSP) and 1/2.86 type full HD 3MOS sensors as the AW-HE130 which results in high sensitivity, high S/N ratio, and high resolution due to its advanced video processing. The HR140 maintains stable shooting performance in the toughest of environments and is compatible with various outdoor environments and applications. In addition to a sharp, fast F1.6, 20x optical zoom lens, the HR140 is equipped with an innovative 1.4x digital extender that can increase the effective focal length of the lens by 40% while delivering smooth, high resolution video. Thanks to a defroster, the glass does not get frozen at low temperatures down to -15ºC (5°F). Even in blizzards, snow that hits the glass surface melts off to maintain visibility. 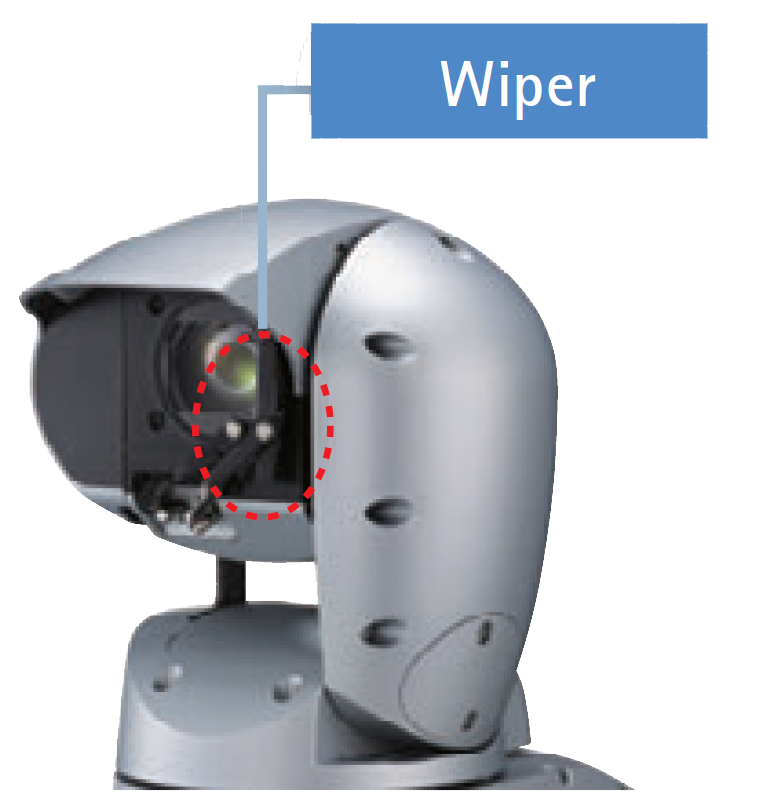 As it can be complicated to keep the lens clear in harsh environments, a lens wiper is included in the HR140. The AW-HR140 has adopted a newly invented stabilizing technology, using both optical and mechanical stabilization. This technology is named Dynamic Image Stabilizing System (D.I.S.S.) and enables smooth shooting outdoors with no loss of resolution. The HR140 can be powered at 12V-24V DC. Additionally, the HR140 is supporting PoE++ for lower installation costs as it is not necessary to install an extra power supply or even a local AC outlet. By connecting to network devices that support the IEEE802.3bt draft ver.2.0 standard, power can be supplied via LAN cable. The camera can provide power to an external device, such as an SDI-to-Fiber conversion module. 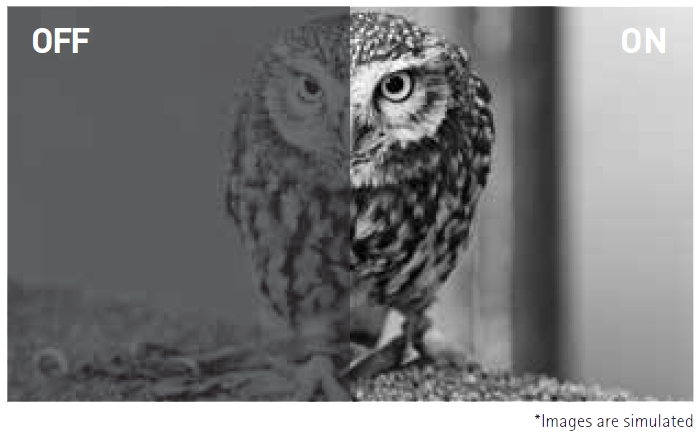 Haze Reduction Function: reduces haze on the picture and make it easier to see the subject that is low in contrast. Strength of the effect can be adjusted manually depending on the thickness of the fog. The camera supports multiple output formats required for specialized applications, including 1080/50p, 1080/50i, 1080/25p and 720/50p. Remote control video capture can now be more easily performed for specialized applications such as tele-production, and scientific research. 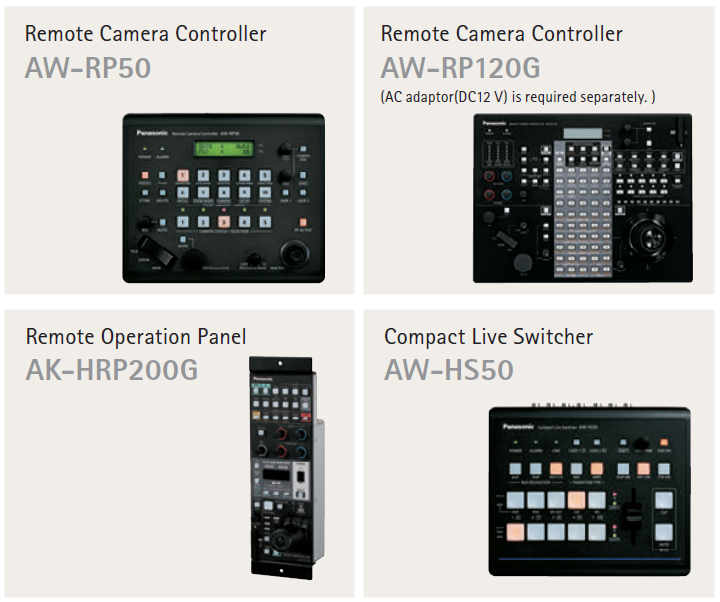 The camera includes two 3G-SDI compatible outputs and one Genlock input. It also supports audio line input (2 channels). 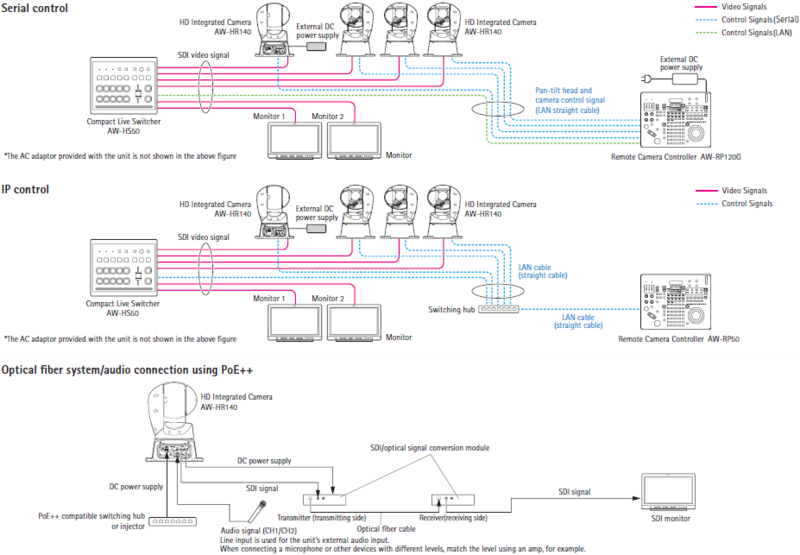 Flexible IP control architecture simplifies system design and operation as up to 100 units can be controlled via IP from a single Panasonic controller. The unit is equipped with image compression and IP transmission up to 50fps, being able to transmit up to 4 video streams at different qualities. Using an IP browser, such as Internet Explorer or Safari, it is possible to set up and control the camera from a remote location. This feature simplifies the management of cameras around a campus, or across a worldwide enterprise network. 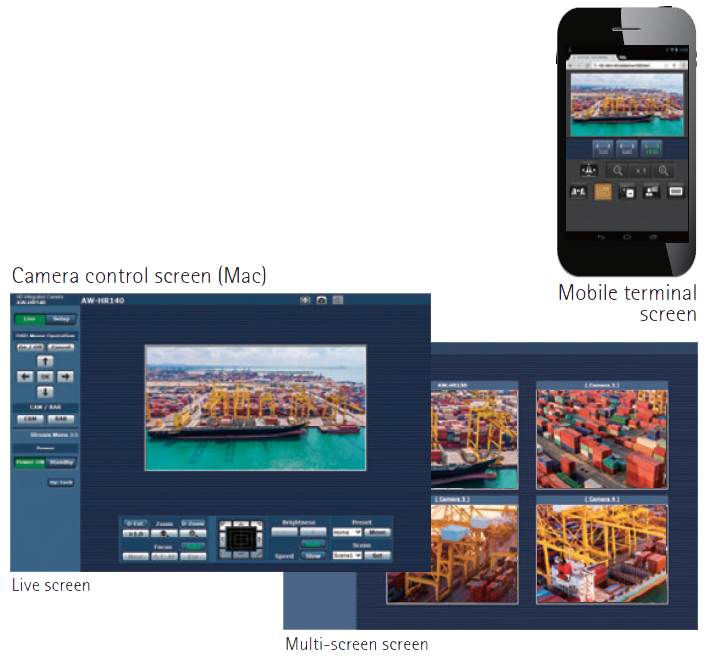 IP video monitoring and remote camera control can also be performed from mobile terminals such as an iPhone, iPad or Android devices. Thanks to a highly evolved pan-tilt design, the HR140 achieves smooth and more natural movement during on-air shots. 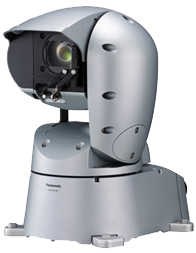 The pan-tilt head has a wide shooting range, with a pan range of ±175° and a tilt range of -30° to 210°. The unit supports suspended installation. The newly developed pan-tilt drive provides high-speed operation at maximum 60°/s, excellent response to remote control operation, and highly precise stop control. These features combine to accurately capture fast-action sports scenes or smooth concert footage. The camera also achieves a low noise level during operation, at NC45 or less at a pan-tilt speed of 60°/s.